Arthur Dixon (1856–1929) trained as an architect and was a friend of William Morris. He founded the Birmingham Guild of Handicraft, which started as a series of evening classes. When Dixon became Managing Director, Claude Napier Clavering took over much of the silver design. Dixon remained primarily responsible for the design of base metals, which formed the largest part of the Guild's output. The Birmingham Guild was always more commercially aware than Charles Robert Ashbee with his Guild of Handicraft. It expanded significantly in 1910, when it absorbed the firm of Gittins, Craftsmen Ltd.
Kettle has a raised collar and cast handle; the stand cast. The kettle is attached to the stand by two rods and chains. Trained as an architect, Dixon was a friend of William Morris. He founded the Birmingham Guild of Handicraft which started as series of evening classes. Claude Napier Clavering became the Managing Director who took over much of the silver design from Dixon who remained primarily responsible for the design of base metals which formed the majority of the Guild's output. The Birmingham Guild was always more commercially aware than Ashbee with his Guild of Handicraft, and they expanded significantly in 1910 when they absorbed the firm of Gittins, Craftsmen Ltd. Despite relentless commercial pressures and a conservative public which favoured historicist revivals, innovations did emerge in European silverware in the early years of the 20th century, prior to the First World War. The cup and cover (1909-10) by Child & Child of Thurloe Place, South Kensington, in a revived, German Renaissance manner illustrates the prevailing mainstream taste for historicism while the Painter and Stainers’ Cup designed by C.R. Ashbee for Harris Heal (1900-01) is a very contemporary and subtle restatement of a 17th century design and epitomises the essence of the British Arts and Crafts movement. By 1900, Ashbee and his Guild of Handicraft had a achieved a stylistic maturity. For a while the Guild even showed a modest profit but events were moving swiftly. In the 1890s the work produced by the Guild struck a fresh and original note. By the 1900s, Ashbee was to witness others adapting his ideas and extending them further. The workshops of Henry Wilson, Nelson Dawson and Edward Spencer of the Artificer’s Guild, Omar Ramsden and in Denmark, Michelsen and Georg Jensen began to produce work that was richer and more self assured than the austere, products of the Guild of Handicraft. These firms successfully popularised the Arts and Crafts philosophy and occasionally incorporated Art Nouveau tendencies. The retailer A.L. Liberty of Regent Street with his Cymric range of silver and jewellery was the amongst the most successful and all remained commercially viable long after the demise of the Guild in 1908. 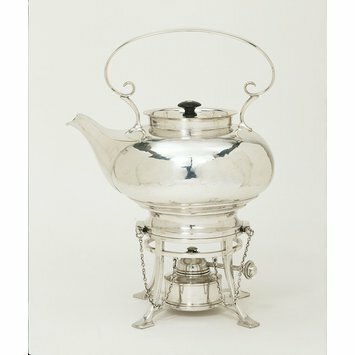 Tea kettle and stand, electroplated nickel silver, Birmingham, 1905-10, Birmingham Guild of Handicraft, designed by Arthur Stansfield Dixon.